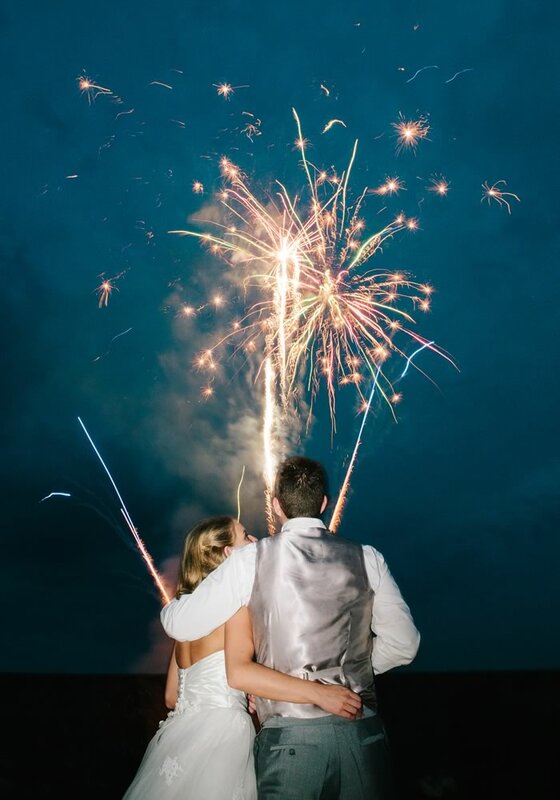 There are so many ways to add a touch of sparkle to your day; will a wedding fireworks display be one of them? From twinkling sparklers to show-stopping displays, fireworks at your wedding can be as big or small as you wish. But, there are certain things to consider when planning to ensure your wedding fireworks display goes without a hitch. Here are our top five recommendations. Remember that in the winter months, night falls far earlier in the evening than in the height of summer. This means that you could hold your wedding fireworks display at an earlier hour with a winter wedding – ideal if you’ve got children attending who will enjoy the display. Tie the knot in the summer and you’ll have to wait until around 10pm for darkness. By this point the dancing and Champagne will have been flowing for hours – will you really be able to get your guests organised outside to enjoy the show? A master of ceremonies will come in handy here – leave the ushering and organising to them! On the other hand, in the autumn and winter months, you’re more likely to encounter rain. Many fireworks displays are weather dependent, so don’t pin all your hopes on it going to plan. Outside space will be essential for any wedding fireworks display to be possible. Beyond that, you’ll need to speak to your venue about what they do and do not allow. Some are happy for you to hold a pyrotechnic extravaganza, while others may stipulate only quiet fireworks or no fireworks at all. There’s no point planning an enormous display, and investing money in it, only to discover that your venue does not permit it. Plus, your venue can probably recommend companies they’ve worked with before to make organising your wedding fireworks display a breeze. And if a sparkling show is a deal breaker for you, best to have that conversation before you book – either the fireworks or the venue! Once you’ve got the go ahead from your venue and found the company to make it happen, it’s time to share the exciting news! Undoubtedly you’ll be desperate to tell your guests, but don’t forget to discuss it with your photographer, too. Not all photographers stay beyond the first dance, so check what is included in your package. If you want the fireworks to be captured, why not negotiate extending their coverage until after the display? A full-scale wedding fireworks display offers the perfect opportunity to capture incredible group photos against the illuminated backdrop. You can also snap dreamy couple portraits as you watch. 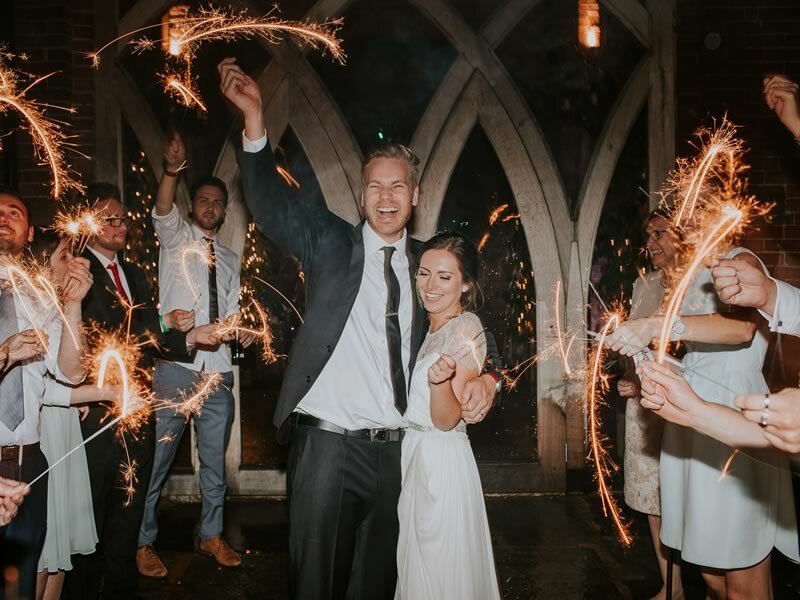 If sparklers are the order of the day, grab your bridesmaids and groomsmen for enchanting pictures together. Have them surround you, draw letters for long-exposure photography or simply act naturally for reportage shots. For more wedding photo ideas with magical lighting, check out these 11 pictures and prepare to be blown away. Whether on an upcycled wooden pallet or printed out cards, your guests will want to know what to expect. 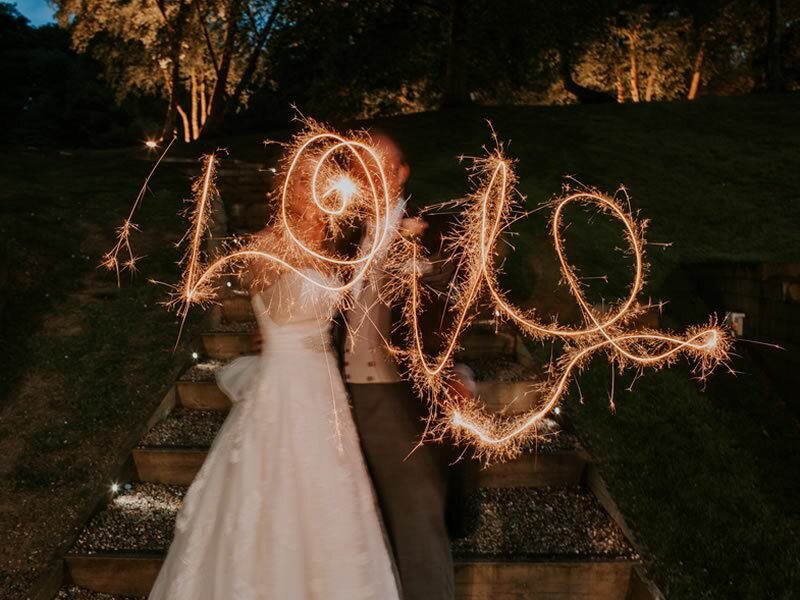 You’ll have already included timings for your ceremony, wedding breakfast, cake cutting and first dance, so why not add your wedding fireworks display to the list too? That way guests won’t turn in early only to discover that they missed out on a magical moment. There are any number of wedding firework suppliers out there advertising their services. They will all do a great job but watch out for things like VAT. Is it included in the price or one of those hidden extras? Also, check basic things like how much public liability insurance your wedding fireworks company carries. £2 million is standard but your venue may ask for £5 million. It’s also a good idea to ask how long they’ve been in business. A newly established company might be risky for such a big day! Finally if you have any doubts or queries about your wedding fireworks supplier please call or email us for helpful and informed advice based on our 33 years of experience. Now that you’ve done the hard work liaising with your venue, photographer and fireworks company, it’s time to sit back and enjoy it! Even if you’ve been apart speaking to other guests beforehand, your wedding fireworks display is the time to regroup. Cuddle up together and enjoy the moment and the feeling that only getting married brings.